I was walking my dog in Richmond Hill, Ontario, the other day and heard this weird chirping in the bush. I had brought my camera hoping for a good bird picture and was rewarded. I did not know what kind of bird it was but in researching it looks to be either a Coopers or Sharp Shinned Hawk (I'm leaning toward Coopers). 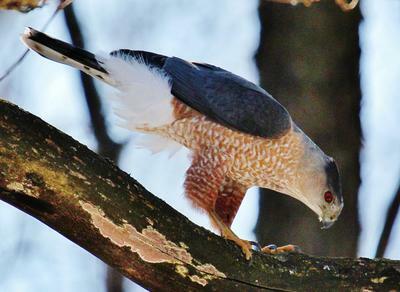 Thank you for telling us about your Hawk sighting, and for the wonderful pictures too! This is a Coopers Hawk for sure and when you said you were leaning towards the Cooper you were completely right.